I’ve done a lot of driving in my life and one thing I have been smart enough to have is a dependable road map. If you don’t have a good plan to get from where you are to where you want to go, you will get lost. I’ve known many people who have started out in business and thought they had a good plan, but did not achieve the success they wanted. A major problem for many of these people was that they had not sought good advice from people who had achieved success. If you don’t learn from the experience of others, you might achieve success but you will probably get there the hard way. You might get lost down many side roads before you find the right one. Roadmap to Success, is a mini-seminar on how to plan for your success. The successful people in this book have the experience that will help you find what you need to create your road map to success. These perceptive business people were fascinating as they unfolded their own personal road map and told me about their various success journeys. How do busy people become successful? Insight Publishing is pleased to present Glenn Smyly, Ken Blanchard & Stephen Covey in an exceptional compilation of resourceful people who will tell you how they learned how to be successful. They will share with you their secrets and reveal some remarkable insights on how to set goals in life and how to accomplish those goals. 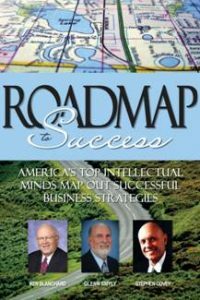 Glenn’s information on Leadership and Success presented in “Roadmap to Success” is thought provoking, mentally stimulating and philosophically intriguing and will help readers discover their vision, map out their mission and begin their own personal journey to success.